Breathing shouldn't be your biggest expense. Yet, choosing an affordable health plan can be difficult, especially when you have a high-cost chronic disease like chronic obstructive pulmonary disease (COPD). Breathing shouldn't be your biggest expense. Yet, choosing an affordable health plan can be difficult, especially when you have a high-cost chronic disease like chronic obstructive pulmonary disease (COPD). 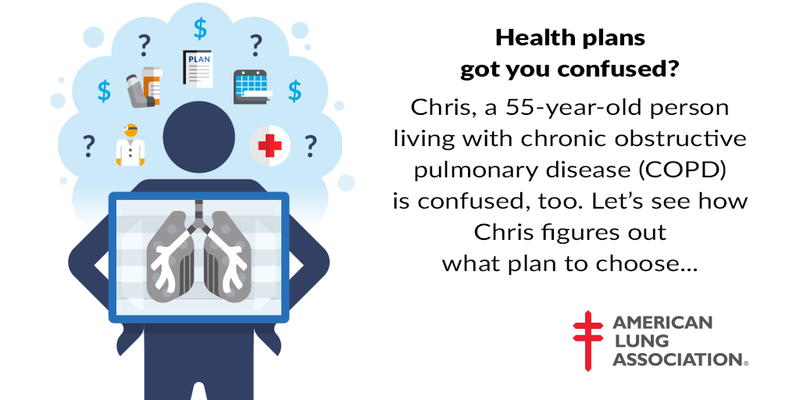 The American Lung Association is very concerned that patients with COPD may not be selecting and using the best health insurance plan for their circumstances because they simply weren't aware of what those out-of-pocket costs would be. Understanding the true, total costs for each healthcare plan is key to choosing the plan you can actually afford to use. 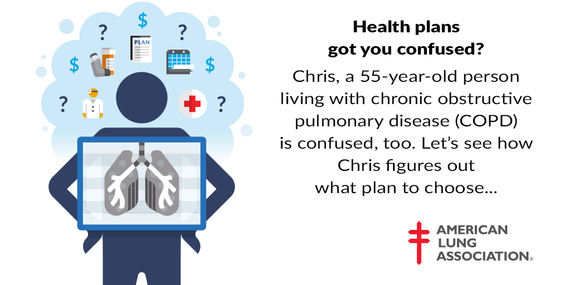 As part of our commitment to support patients with lung conditions like COPD, the American Lung Association has created a step-by-step infographic tool to help guide COPD patients under the age of 65 who are not yet eligible for Medicare as they choose a health care plan that best fits their needs. We know that many people with COPD have significant healthcare costs that can add up during the course of the year. So during the decision-making process, it's important to consider all of the factors that can affect your yearly out-of-pocket costs, including premium, deductible and co-pay or coinsurance amounts. This tool is designed to help you select a health plan from Healthcare.gov or a state exchange with the balance of coverage and out-of-pockets costs that's right for you. How many COPD exacerbations do you experience per year? How many visits with a primary care physician and/or a specialist do you expect? Do you normally experience a hospital stay? Do you take any other medications to manage other medical conditions? Premiums: Paid each month to be enrolled in a health insurance plan. Deductibles: Paid for covered services before the plan begins to pay. The maximum out-of-pocket (MOOP) limit: The cap on out-of-pocket costs paid for covered services in one year. (1-800-LUNGUSA) to speak with a certified enrollment counselor to help you choose the best exchange plan.